“Just awful,” wrote actress Mia Farrow on Twitter in response to the news. CNN analyst and former member of the Obama administration John Kirby warned the troops that having a Trump campaign hat could be breaking military guidelines. “It’s just not appropriate in front of a military audience,” Ret. Lt. Gen. Mark Hertling said on CNN Thursday morning. In Germany, several soldiers brought their MAGA hats during their meeting with the president. Another soldier was spotted carrying a Trump flag. Philippe Reines, a former adviser for failed presidential candidate Hillary Clinton doubted whether the troops even purchased their own hats. trump signed MAGA 2020 hats. 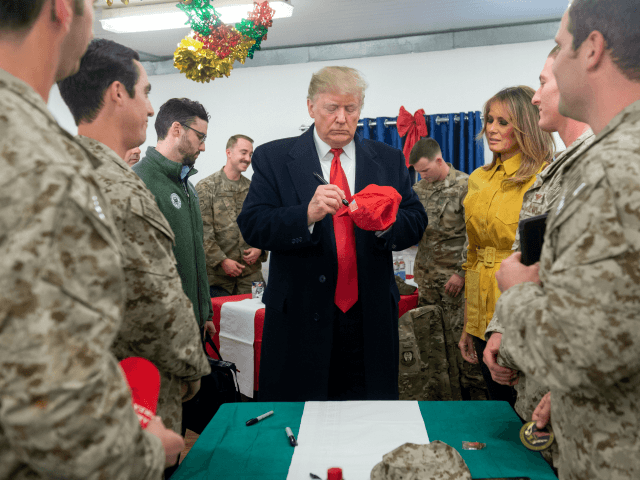 Safe bet our troops in Iraq aren’t buying and shipping hats to themselves 6,000 miles away in case he drops by. Which means rbis was another taxpayer funded trump commercial. And unethical. Trump’s opponents continued to complain on social media. “As a former Navy JAG, I can tell you that engaging in partisan political activity such as flying a Trump flag or wearing a MAGA hat, while in uniform is a violation of the Uniform Code of Military Justice and its implementing regs,” wrote Pam Keith, a Democratic candidate for Congress in Florida. “That’s a Art 32 offense for conduct unbecoming of an officer,” wrote MSNBC analyst Malcolm Nance.